Opera Miramar, based on the novel by the Nobel laureate Naguib Mahfouz (1911-2006), premiered in 2005, on the occasion of the 95th birth anniversary of the author. The opera, to a libretto by the celebrated vernacular poet Sayed Hegab and music by Sherif Mohie-Eldin, is a joined production of the Bibliotheca Alexandrina and the Cairo Opera House. The opera was performed again at the Main Hall of the Cairo Opera House on 14-17 December. Throughout history a great number of literary works has been adapted to other creative forms, such as films and operas. Understandably literary forms concentrate on narrative, and the reader is expected to create his own –often very personalized – visual interpretation. But when a literary text lands on the desk of a scriptwriter or a librettist, this is the start of a new – fixed – visual proposition. This semantic transposition becomes the birth of a new creative work, and the success of the new medium depends on many factors generated by the original text and its suitability to the screen or stage, choices and eliminations which the scriptwriter or a librettist is forced to make. Some literary texts make excellent material for such transpositions. Others, if not downright impossible to translate to a new medium, are a challenge and sometimes the greater part of that challenge is the absence rather than the presence in the text of requisite elements. Named after the small boarding house in which it is set – a sort of representative microcosm – Miramar is a complex novel with many voices: the story is told by four different characters, and it develops through being repeated from a different point of view each time, leading up to a single if polyphonic statement about the transformation that occurred in Egypt society following the July Revolution. The characters hopes and disappointments are shown against the backdrop of class shifts. One young peasant girl Zohra – in many ways the catalyst of the story – symbolises hope for the new Egypt; her fate remains nonetheless devoid of the conventional storyline, the novel makes for challenging material; the librettist is required to make potentially disastrous omissions in the absence of both plot and climax. Sayed Hegab, somehow managed the next to impossible: in his libretto the opera reduces the novel to a single narrative in which all the characters' viewpoints are nonetheless present, together with the same relationships between them. But since the thrust of the novel – the bulk of the energy that derives it – is outside the arena of plot, something is inevitably lost once it has turned into an opera. Hegab stressed the interaction of the characters, benefiting from the plurality of the text, but he could not quite make up for the lack in the book of the kind of dramatic direction leading, through a climax, to resolution required for opera. Still, the libretto should be judged on its own terms, and insofar as Hegab reflects from the narrative multiplicity of Miramar, faithful to the spirit of the book, he offers an equally poignant interpretation. Likewise the music: Sherif Mohie-Eldin, who brought the opera into being, created a unique combination of Arabic modal music and Western harmonic composition. Throughout the opera, Eastern and Western elements are entwined. The orchestra consists of the classical Eastern Ensemble – known as Takht – and Western instruments sonorities. This combination creates a range of passages attractive to both Western and Eastern ears, broadening the spectrum of appreciation. Mohie-Eldin created a number of instrumental dialogues, especially remarkable in supporting the vocal lines in Scene II of Act 2: the duette by Hosny (Elhamy Amin) and Safeya (Gihan El Nasser), followed by extended solo performances by Mansour (Hisham El Guindy) and, later still, in Scene IV, the duet by Mansour and Doreya (Ingy Mohsen). The ongoing juxtaposition of Eastern and Western styles did give some singers a hard time in parts. Reda El Wakil (Tolba Bek) delivered musically clear lines, but the delivery of Walid Korayem (Ammer) and Abdel Wahab El Sayed (El-Abbassy) was frequently questionable. 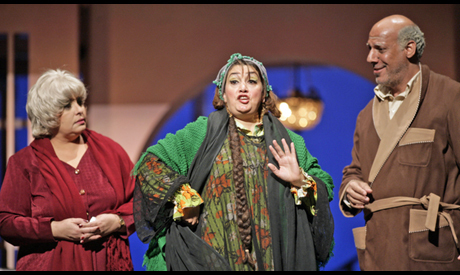 Nevine Allouba (Marianna) managed well, once again, but above she had intense stage presence. The opera does not lack musically developed, engaging. One captivating part composed for voices only was Scene X from Act 2 with Aleya (Jolie Faizy), Zohra (Mirhan Damir) and Sarhan (Moustafa Mohamed) – in which Zohra is being taught alphabet. Aleya and Sarhan reaffirmed their skill in their duet in Scene XIII. Yet musical ideas, though original in themselves, became repetitive as the drama progressed. Taking into account the fact that the plot is not sufficiently dynamic, one felt the need for additional musical realizations; the polyphonic lines did not always make up for the dramatic drawbacks. At the same points however, Mohie-Eldin challenged the instruments limitations, something that was particularly apparent in the French horn. Miramar definitely included many truly successful instrumental and orchestral parts, in particular those completely composed by Mohie-Eldin. It also embedded compositions by J.S. Bach: Baroque passages intended to enhance the link between Western sonorities and Arabic modes but not justifiable in relation to the dramaturgy or the characters. Pleasant as they were for the Western ear, the Baroque passages took the form of disjointed intervals. One of the strongest elements of Miramar was the set and the mise-en-scene. Mohamed Abou El Kheir, the director, brought a complete two floor pension onto the stage. He used a known and powerful approach “the fourth wall” – where the building wall facing the audience is removed but not the walls separating the different rooms occupied by the characters. The plurality of Mahfouz’s original novel was thus captured visually. The space added practicality and helped the director to set a simple mise-en-scene suitable for the singers’ abilities. Without equaling the novel in sheer dramatic power, Miramar is definitely a step on the way to a true Egyptian opera. It is among very first works to carry many Egyptian compositional elements and opens the door to further exploration. Cairo Opera House Main Hall. 14-17 December; Opera Miramar, based on the novel by Naguib Mahfouz Miramar, libretto: Sayed Hegab, Composer and Conductor: Sherif Mohie-Eldin, Scenographer and Director: Mohamed Abou El Kheir, Cairo Opera Choir, Bibliotheca Alexandrina Chamber Orchestra, Bibliotheca Alexandrina Choir.